If you use an iPhone 3G, 3GS, or iPod Touch and are constantly frustrated by the inability to take pictures in dimly lit locations, the iFlash might just be the perfect accessory for you. 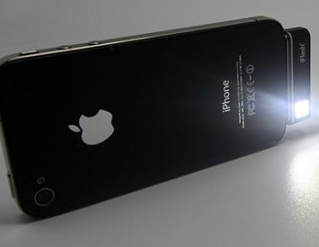 The iFlash plugs into your iDevice’s docking port and presto… you have light! It is designed to conveniently fit underneath most cases and can also be re-purposed as an LED flashlight. According to their website, by attaching the module to your iPhone with a plastic 3.5mm jack it can dangle like a phone charm, although that just sounds tacky to us. It is available here for $29.95 and would make a great stocking stuffer.